Afro-jazz musician, Dudu Manhenga says becoming a church minister has significantly changed her life as she now reaches out to multitudes of people in a different way. While appearing to have abandoned her music fans as she no longer performs at public shows in bars and clubs, Dudu who celebrated her 38th birthday on Sunday, said she now revels in her new preaching role. She became a deaconess in 2010 before becoming a fully fledged pastor at the Jubilee Christian Centre, which falls under the Pentecostal Assemblies of Zimbabwe. 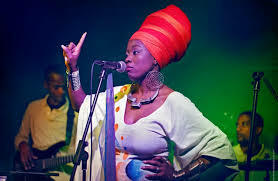 Dudu however said there is an umbilical cord relationship between her and jazz music hence she continues to perform at private corporate events and campaigns for specific causes. Last year she performed at the Victoria Falls Jazz Festival where she revealed how her life as a pastor had touched many. “I’ve now invested in God’s ministry as a pastor and I’m now touching people’s lives in a different way. The difference is that when you’re performing as an artiste, you have to build a name to be known, but when I minister, it’s Jesus’ name I call to and glorify,” she said. Dudu said the transition from the stage to the pulpit was a scary journey because it involved a higher calling. “I made the decision and went to school in 2013. I really think I should have listened to the voice earlier but I delayed for seven years. The change has been a journey but I believe everything is working perfectly well now. “I no longer do bar shows as I stopped doing so in 2009 because I knew something was looming in the background. I now do private and corporate events and festivals where I’ve just maintained a couple of clients. I love jazz hence whenever there’s a festival, I’m part of it,” she said. Dudu said she remains a social entity though as she takes part in awareness campaigns for different initiatives. Having had a rough brush with the law in 2013 when she was convicted for negligent driving and causing the death of a motorcyclist in 2010, one would conclude that the experience turned Dudu to God. She however said the experience had no bearing on her new path in life. “No, not an inch. That just made exciting news for some sections of the media, but it’s not in any way linked to my ministry life because in 2010, I’d already become a deaconess and was in Bible School in 2012. Dudu said she is grateful to her family for the support they have been giving her.